Inspired by the arches and domes of Byzantine architecture, our elegant Byzantine Scarf is a delight to make. This pattern offers two methods for joining the motifs: in the traditional method or in the revolutionary Continuous Crochet Motifs method. With the Continuous Crochet Motifs method, there will only be 2 ends to weave in when joining the 15 motifs compared to 30 ends with the traditional method of joining motifs. 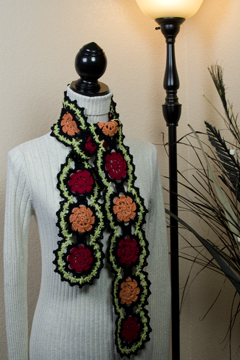 The Continuous Crochet Motifs method is a real time saver! And with our step-by-step photos to guide you along the way, you’ll soon be singing the praises of this fantastic method for joining motifs! The pattern includes written instructions, step-by-step photos and 2 crochet symbol charts: one for each of the motif joining methods.